Four of five candidates — Richard Boykin, Isaac "Ike" Carothers, Ron Lawless and Blake Sercye — attended the debate. Brenda Smith was not present. Former 29th Ward Ald. Carothers, who spent roughly one year in federal prison after pleading guilty in 2010 to bribery and tax evasion, said he has paid his debt to society and that God "believes in forgiveness." He added, however, that he wasn't given a fair shake in the media, but did not go into specifics. "Everything you read in the newspapers is not an accurate portrayal of what actually really happens, and I'll leave it at that; no one knew the facts of my case but me," Carothers told a crowd of about 100 people at the debate. Richard Boykin, a former chief of staff of Congressman Danny Davis (D-Chicago), who has faced recent scrutiny for claiming property tax homestead exemptions that he did not qualify for, said the tax breaks that saved him thousands were an oversight and immediately corrected once brought to his attention. Boykin accused critics in the race of attacking his family. "This is personal to me; it's personal because people's families in politics ought to be off limits," he said when asked why voters should not be concerned about the discrepancy. Candidate Ron Lawless, who has openly rebuked Boykin for taking the exemptions, said his criticism has nothing to do with the candidate's family. "Either the person is incompetent or dishonest; you can't not know you're not getting a homeowner exemption when, in your second bill, it lets you know you're getting a homeowner exemption," Lawless said. Lawless defended his own record as to whether or not he's a viable candidate, although in the race for the same job four years ago, he earned only 14 percent of the vote. "If I get 14 percent of the vote this time, I think I might win," he said of the tightly contested race. Blake Sercye, who has received endorsements from Cook County Board President Toni Preckwinkle and Chicago Mayor Rahm Emanuel, shrugged off charges by opponents that his candidacy is bought and paid for by the Democratic power structure. "I love it," he said. "I started this campaign at train stops handing out pieces of literature to anybody who would take one, and all of a sudden we have become the party candidate." He said the endorsements show that leaders want a commissioner who is "proudly Democrat, honest, ethical and trustworthy." Overcrowding in Cook County Jail was a central topic for candidates, who addressed the high number of African-American inmates, many of whom suffer from mental health issues. Cook County Sheriff Tom Dart was quoted earlier this month in a New York Times article, stating that the jail "is so screwed up that I've become the largest mental health provider in the state of Illinois." Dart also said in the article that of the 11,000 prisoners in the jail, roughly 2,000 suffer from mental illness. Boykin said the fact that more than 90 percent of those jailed are African American is also "a disgrace to our county." "The state, since 2009, has cut over $100 million from the mental health budget," Boykin said. "We see folks going to Cook County Jail just to get treatment." Boykin said his campaign launched a ballot referendum for November to send a message to the Illinois legislature to increase mental health funding. Sercye, however, said the referendum would have little effect. "I think we all know that if we go to Springfield right now, what are they going to say?" Sercye asked. "They're going to say, 'We don't have it.'" He said better efficiency and reducing the number of inmates in the jail is the solution. "If we want to get more money for mental health issues, we have to better coordinate the services that we offer between the city and the county," Sercye said. A progressive income tax being considered in the legislature also would increase revenue for mental health services, Sercye argued. Lawless was skeptical of the potential of such a tax increase. "Let's be honest, it ain't gonna happen," Lawless said. Both he and Carothers said leadership at the state and county level has failed to solve the problem, and a new slate of commissioners and lawmakers is needed. "The bottom line is that until we start to elect people who represent what's in our best interest, we're going to continue to get the same old-same old. The issue of mental health will still be an issue four years from now," Lawless said. Carothers said of the jail: "To hear the sheriff say that Cook County Jail has become an insane asylum is outrageous. It's the same Cook County that's under control of the current administrators and the same Cook County Board, so who's doing something about that?" 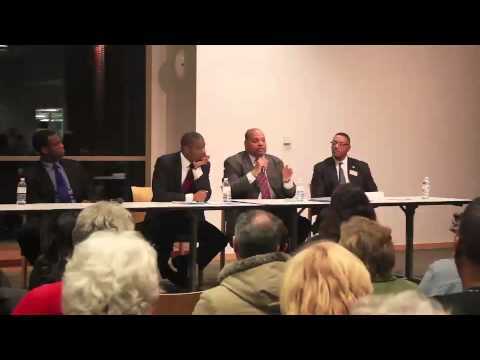 Candidates also shared their positions on how to improve the county hospital system. Sercye said the hospital system needs to maintain adequate staffing levels "so people get processed quicker" and improve information sharing within the hospital system to make the process smoother for patients. "We're going to better connect the hospital system, so that people know that when you come to Cook County not only are you getting our resources but also of our partners," he said. "We have to make the county hospital system competitive, so [patients] want to go there instead of somewhere else," he added. Carothers took a different approach, saying most people go to the county hospital "because they have to." "Most people who have other alternatives go to other places," he said. Carothers said that in order to ease the burden on the county system, the county has to figure out a way to let patients go to other medical facilities. "They just have too many patients, and doctors aren't treated the same there as they are at other hospitals," Carothers said. "We have to ease the burden on county hospital and figure out a way to open up the system, so people can go to other hospitals and still receive their care, even if they're poor." Lawless said wait times have dropped at the county hospital, but there is still work to be done. "The county hospital still has a lot of issues and concerns, but at the same time they have made a lot of improvements, and I think that those workers are working hard, and they are doing the best job they can," Lawless said. Boykin said that as chief of staff of Congressman Davis, he helped "double the number of community health centers throughout this country." "We currently have 250,000 fellow residents who currently haven't signed up for what we call county care. We've got to get them signed up for county care, so that they don't become a drain on taxpayers," he said.